VMworld 2018 was my second year of attendance, after attending for the first time last year. In building out my schedule this year I emphasized opportunities for interaction with other attendees and things that were not recorded. While I still tried to cover a range of topics, my upcoming and active project list is more VDI and EUC focused than last year, and thus I forced less breadth of topics into my session selection. Based on feedback from one of my colleagues in attendance last year, I was interested in trying out one of the expert led workshops. 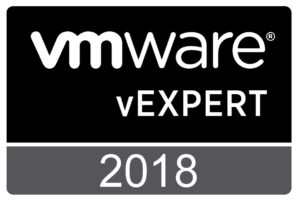 Knowing these sessions fill quickly VMware Horizon 7 – Security, Operations, and Troubleshooting Workshop was the first session I added when schedule builder opened. I enjoyed the session, picked up some good information, and participated in some great discussion. A big part of enjoying the session came down to having presenters who encouraged questions and discussions and having attendees were willing to participate and contribute to that discussion. While vSAN Operations and Management Recommendations with expert Jeff Hunter lacked a roundtable (or table of any kind) there was a whiteboard. I think this was probably the session I walked out of with the most recorded notes. As with the Expert Led Workshop, the discussion and interaction added a lot of value over a rehearsed presentation. As much as I enjoyed Opening Acts last year, I started off VMworld differently this year, opting for the Education Industry Session, How Technology is Impacting the Next Wave of Higher Education Innovation. This turned out to be a nice combination of presentations and free-form discussion. This was a great opportunity to hear about successful projects from several higher education environments as well as an opportunity to get into the organizational and technical weeds with the presenters and other attendees on how they accomplished those successes. Hopefully this is a session that will continue in future years, pulling in even more of the great work happening in higher education. Being the second session in the only block of back-to-back sessions on my schedule this year, I arrived to a rather full room. Fabian Lenz (@lenzker), Sean Massey (@seanpmassey), Eduardo Molina(@molikop), and Dane Young(@youngtech) were a great set of panelist for this. They discussed a wide range of present day VDI topics with Brian Madden (@brianmadden). Included in all of this were some spot-on remarks by Brain about Higher Education’s possible use of cloud based virtual desktops. In addition to the session recording, you can find numerous tweets by way of the session hashtag #WIN3530PU, including a large number by fellow EUC Champion Tony Foster (@wonder_nerd). Mark Brookfield (@virtualhobbit) and Katarina Wagnerova (@_KatkaW_) and Achieving Happiness: Building Your Brand and Your Career with Amanda Blevins (@AmandaBlev) were of the traditional breakout format, both were great deviations from the usual technical nuts and bolts deep dives and new feature surveys. As with last year, VMworld 2018 was great experience. I had some great discussions, continued putting faces and handshakes to members of the virtualization community previously only known by twitter handles or email addresses, and picked up some technical knowledge. Finally, while absent from this post, I had an excellent time at the Hackathon and expect you’ll see more from that in future posts.